RHYTHM OF THE NEEDLES: Thursday Nights are Mine! It's a night for guilty pleasures. 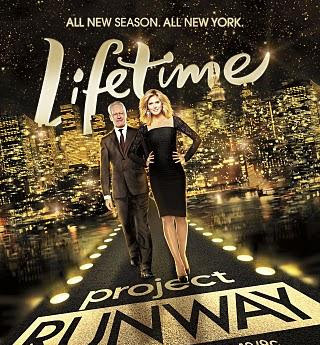 In 10 minutes Project Runway, season 8, will be starting and this season the show will be 90 minutes long. Afterwards is "On The Road With Austin & Santino". These are two of the more colorful and funny contestants from the first and second season of Project Runway. Time to choose a knitting project to work on during the shows. Ah, I'm going to like Thursday nights for the next couple of months! It was so good to enjoy P. R. again, and to watch the new Austin and Santino program. Santino made me laugh so many times when he was on P.R. with his stories and imitations of Tim Gunn. I was laughing again tonight. The show is more subdued that P.R., but fun just the same. I saw this sweater on the preview of the Austin and Santino show, but didn't spot it tonight. It's a style I like and the color combination works. I'll watch for it in a future show so that I can have a better look at it. LOVE Project Runway. Make it happen! Happy Canada Day! Bonne fête du Canada!